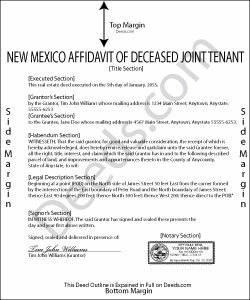 New Mexico's statutes define joint tenancy at 47-1-36. This law states that a "joint tenancy in real property is one owned by two or more persons, each owning the whole and an equal undivided share, by a title created by a single devise or conveyance, when expressly declared . . . to be a joint tenancy." Property titled in this manner cannot be passed in a will; instead, a deceased joint tenant's share is distributed equally amongst the survivors as a function of law until only one person holds the property in sole ownership. While technically accurate, this description oversimplifies the situation. What happens when it's time to sell the property? Unless the local recording office cross-references death notices with real estate records, the deceased owner's name still appears on the title. This inaccuracy can create confusion during a title search and slow down the transfer process. In addition, outdated ownership information might interfere with property tax billing, which could lead to unnecessary fees and/or penalties. The surviving owner(s) may prevent these potential issues with a simple step: when one joint tenant dies, the other(s) can execute and record an affidavit of facts as to death with the local recording office. It is possible to address this at the time of sale, but it makes sense to handle it within a short time after the owner's death because the necessary documentation is more likely to be easily accessible. This action keeps property records up-to-date, verifies the owner's interest and rights to the title, and ensures smoother transfers in the future. Each circumstance is unique, so please contact an attorney with questions or for complex situations. Reply from Staff: Thank you Ralph. Have a great day! Reply from Staff: Thank you for the feedback Richard. Currently there is no way to download all of the documents at once but we'll definitely look into it. Have a great day!